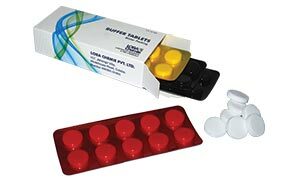 Loba Chemie pH Buffer Tablets offers easier way to prepare buffer solutions of required concentrations. One has to simply dissolve tablet to 100 ml deionized or distilled water and a solution of the specified pH will be ready for use. Beside buffer tablets, Loba Chemie product array also includes ready to use buffer solutions and concentrate buffer solutions with different pH.